1. George Robert Stewart b 26 Dec 1919 Shelby Pike Co KY; m. Georgia Niece. 2. John Stewart b 30 Mar 1921; m. Betty Johnson. 3. 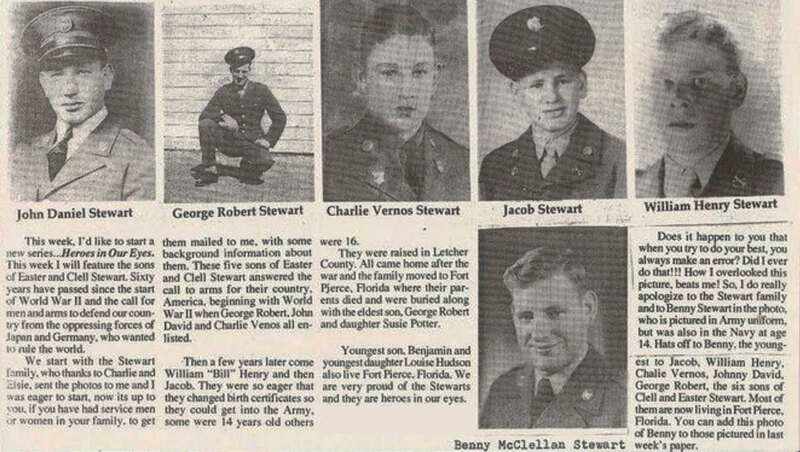 Charlie Vernice Stewart b 30 Mar 1923 Pike Co KY d 19 Feb 2005 Ft Pierce FL; m. 18 Sept 1945 Whitesburg, Letcher Co KY to Elsie Pearl Mullins; d/o Mantford Mullins and Nancy Mullins. 4. Ellen Susie Ann Stewart b 30 Jun 1925 d 19 Apr 1995; buried Hillcrest Memorial Gardens, Fort Pierce, St Lucie Co FL; m. 15 Dec 1941 Letcher Co KY to Ben Potter b 11 May 1921 d 8 Nov 2003; buried Hillcrest Memorial Gardens, Fort Pierce, St Lucie Co FL; s/o Forster Potter and Dora Elkins. 5. 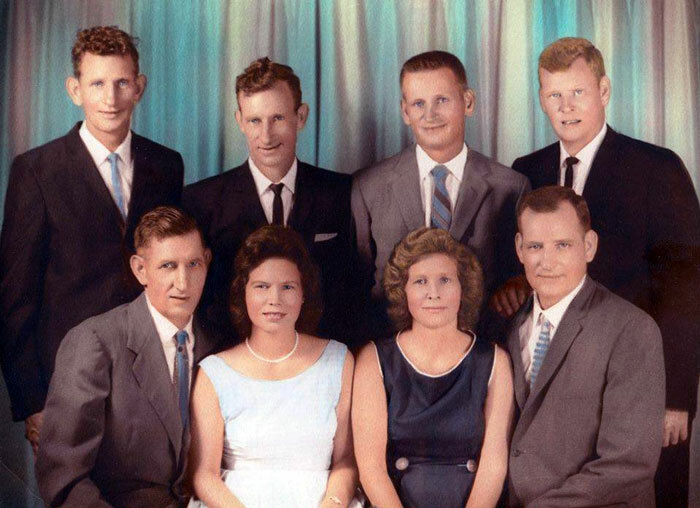 William Henry "Bill" Stewart; m. (divorced) (1) to Billie Joyce Johnson b 8 Dec 1931; d/o McCoy Johnson and Ida Fuller. 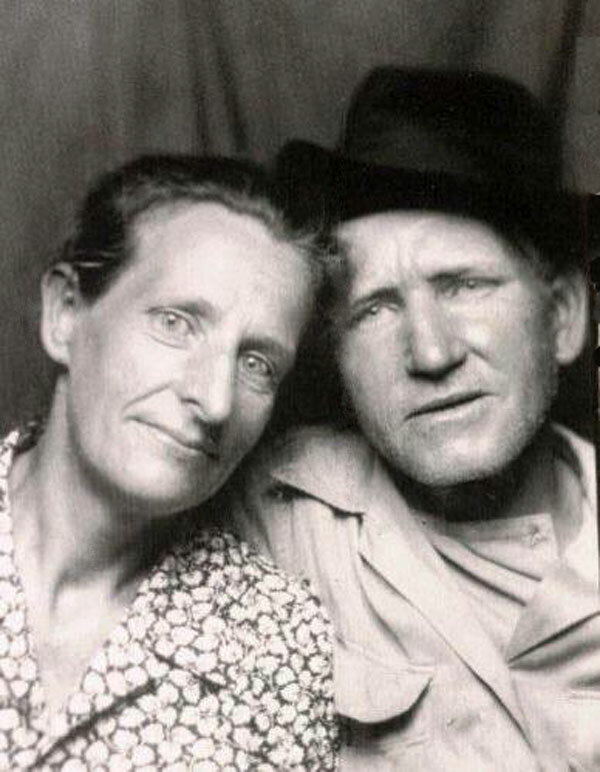 William Henry "Bill" Stewart b 13 Jul 1927; m. (2) to Marlene Thomas. 8. Jacob Daniel Stewart b 19 Dec 1933; m. Avenell Chumley; d/o Lomy Chumley and Bertha Unknown. 9. Myrtle Louise Stewart b 29 Apr 1936; m. (1) to Male Browning. Myrtle Louise Stewart m. (2) to Male Meeks. Myrtle Louise Stewart m. (3) to Male Hudson.